You are here: Home » MEDIA » Books » Creating The Worlds Of Star Wars: 365 Days by John Knoll with JW Rinzler (book review). 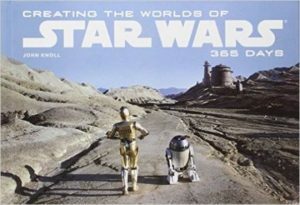 Creating The Worlds Of Star Wars: 365 Days by John Knoll with JW Rinzler (book review). In assembling ‘Creating The Worlds Of Star Wars: 365 Days’, John Knoll set himself an enormous task. Over the course of 365 pages, he takes one photo for each day each detailing a different aspect of the production of the first six ‘Star Wars’ films. Focusing mainly on the Special FX and having access to hundreds of photos from the Lucasfilm archive, this book takes us through over twenty-five years of film-making, from the experimental model and camerawork conducted by the innovators at Industrial Light And Magic in the mid-70s for ‘Star Wars’ to the all-digital creation of ‘Attack Of The Clones’ and ‘Revenge Of The Sith’ in the twenty-first century. Having watched many documentaries and read books on the making of the films, I was delighted to see so many unfamiliar pictures. It’s quite something to see a picture of an audience in a screening room with storyboard artwork for ‘The Star Wars’ pinned to the wall. George Lucas and Gary Kurtz sit at the back of the room, notes in hand. Sitting in a large armchair in front of them is a young visual effects technician named Dennis Muren. He would go on to pioneer the use of CGI in movies that astonished audiences in ‘Terminator 2: Judgement Day’ and ‘Jurassic Park’ which in turn paved the way for the ‘Star Wars’ prequels. He also writes the book’s introduction. Knoll’s book does a great job at illustrating the inventiveness, hard work and camaraderie that the production team had on those earlier movies. Some of the photo choices are revealing. It’s interesting to see how far Carrie Fisher and Mark Hamill are above the floor when filming their iconic ‘swinging across the chasm’ scene on board the Death Star. It’s equally surprising to see that the set team had to keep mopping the shiny Death Star floors clean, because they kept picking up dirt. There are also examples of where sets didn’t make it to the final movies. There’s a great picture of some set-builders from the UK sitting in a troop carrier they’d built for ‘Return Of The Jedi’. The photo was taken because Lucas wasn’t in the country and wanted to approve all of the sets himself. Being an Abrams title, the book is gorgeously presented in a landscape ‘widescreen’ format. Being in hardback, this means the title is about the same weight and size of a large brick, which is immensely satisfying, given all the content inside. John Knoll is a Visual Effects Supervisor himself and is currently working on ‘Star Wars: Rogue One’, so he knows a great deal about the process and is able to inform around all of the photographs presented. This means that a lot of the content is fascinating to a fan like myself who loves ‘Star Wars’ and film-making, but it might be too much for the casual fan. Another point to make is that when the effects process switches to a largely digital approach for the last two prequels the amount of detail on the sets gets smaller. This is because a lot of the backgrounds are digitally generated, so only the forefront of sets, seats, cockpits etc are actually built. This means a lot of pictures of blue and green backgrounds. While it is surprising that so much of what you see is computer-generated, the pictures get a little samey after a while. That’s a minor gripe, however, as this is a perfect coffee table book to be dipped into, there is so much behind-the-scenes content it will keep any ‘Star Wars’ fan happy for hours. From panoramic 360 degree shots to photos of Anthony Daniels acting as C3PO, but wearing jeans as he’s only filmed from his waist up, this is a fantastic addition to any ‘Star Wars’ collection. « The Very Best Of Fantasy & Science Fiction Volume 2 edited by Gordon Van Gelder (book review).